In the October general conference following the murders of Joseph and Hyrum Smith, members were newly encouraged to give their all for the completion of the Nauvoo temple. In order for the temple to be finished in time before the Saint's planned departure for the Rocky Mountains, members would have to newly commit to paying their tithes, whether in substance, in labor, or both. *Often more than once, as documented here. In recent years Taylor's words have been taken completely out of context. That excerpt is taught today as though Taylor meant that a person behind on his tithes should be prohibited from entering the temple. But the temple was not yet finished, and baptisms in those days had never been performed in any temple. No, Taylor was merely expressing his opinion that any person during that time of great urgency who refused to assist in getting the temple finished, probably wasn't fit to stand in for a proxy baptism down at the river. Many today also invoke John Taylor's name because they presume he was president of the Church at the time he spoke those words, which in their minds means he must certainly have been speaking for the Lord, rather than merely expressing an opinion. And so today that offhand remark has somehow attained the status of doctrine in the minds of many modern latter-day Saints. I don't disagree with what John Taylor said. It would be difficult to understand why anyone in those days would refuse to pay his tithes toward completion of the temple when the necessity of completing it was such an urgent priority. But I suppose someone must have felt he could slough it off and that it was more important to continue with baptisms, or Taylor's clerk probably wouldn't have asked for his opinion on the matter. But although I agree with John Taylor's opinion, his opinion is not doctrine. And until fairly recently, Taylor's opinion was rarely used to justify keeping a believing latter-day Saint from entering the House of the Lord. I bring this up because once again we find ourselves in the month of December, the traditional time of ward tithing settlement, and Taylor's quotation is often trotted out not only to encourage members to be current with their payments, but also as a gentle reminder that they could risk losing their temple recommends if they fall behind. As I demonstrated in a previous post, tithing settlement today is a bit of an anachronism, not really necessary for most members to take part in. Although the Lord set up tithing as an annual payment, most members keep current monthly. Still, for farmers and others whose increase is not calculated until after the harvest, bishops have traditionally set aside a couple of days to "settle up." During most of my lifetime in the church, there would be an announcement in Sacrament meeting to the effect that a sheet of paper would be on the door of the bishop's office, and anyone needing to meet with the bishop for tithing settlement could just sign up. In recent years (and I'm not sure exactly when this started) tithing settlement somehow became mandatory. Members of the bishopric would corner you in the foyer or call you at home to make sure you had an appointment to show up. People who felt they had escaped attention have written me to report the bishop coming to their home and sitting at their kitchen table to discuss their personal finances. Rather than a convenience extended to those few members requiring it, tithing settlement has become a year-end "fatherly visit" with the bishop so he can make sure you pass muster. And for those who hold temple recommends, John Taylor's words are often invoked to remind them their recommend can be revoked any old time the bishop feels like pulling it. What I am particularly not keen on is the current practice of granting or withholding access to the temple over the heads of some members as though it were a reward or a punishment. Believe it or not, members didn't used to be grilled and interrogated with a set list of questions in order to be found "worthy" to enter the temple. There was a time when your bishop knew you well enough to know your heart and was able to judge your devotion to Christ. The people at the temple didn't know you from Adam, however, so your bishop would give you a written "recommend" to show at the door, so called because it said to the staff at the temple, "I know this guy. I recommend him." And in you went. 1. Are your Corporate Dues paid up in full? 2. Are you willing to swear an oath of loyalty to the First Presidency and Quorum of the Twelve? You may think the way I've worded those questions is an unfair exaggeration, but I can give you a long list of names of faithful members who would tell you that's pretty much what it comes down to. Let's set aside question two for now, and concentrate on the failure to comply with the first obligation, the obligation of tithing. Every one of the people I refer to on that list I keep believes wholeheartedly in the law of tithing. They wouldn't begin to think about not continuing to pay their tithes. They have just decided not to entrust those sacred tithes to the corporate Church for the time being, that's all. Now, I want to make a couple of points perfectly clear. First, I would not presume to advise anyone reading this that they should not tender their tithing directly to their local bishop. Certain persons associated with Church headquarters in Salt Lake City get kind of itchy when they suspect anyone might be hampering the flow of funds into Church headquarters, as I learned immediately after I published this information. The last thing I want is to get on anyone's bad side. So let me make this clear: if you feel inspired to pay your tithes into the coffers of the Church, by all means continue to do so. I think you should. All I'm doing here is reporting on what others have chosen to do to fulfill their obligation to the Lord. I ain't takin' sides. But I will happily mention some of the reasons a growing number of Saints are getting fed up with the status quo. And when I say a growing number, I'm talking about an estimate of a couple of thousand, conservatively. I'll tell you where I got those numbers at some later date. I'm not talking here about inactives. The Church claims 15 million members. Of those, only about 4.5 million could be considered active in the church. The remaining 10 million or so, it can be safely assumed, are not what we might call full tithe payers, so let's forget about them for now. I'm interested in reporting on those who want to pay tithing, who continue to pay tithing, but who, in the past couple of years or so, have felt strongly inspired to pay their tithes somewhere other than directly into the bank account of the Corporation of the President, which is where all LDS Church tithing funds are deposited now. So let's talk about the why. I grew up being told that tithing doesn't count if you pay it anywhere other than directly to the Church. That's what I was taught. But I'm not real sure there's any truth to it. I think tithes and offerings count most when you give them where they are needed most. So this growing number of faithful Saints are asking the question, "why hasn't the Church been leading us toward Zion? Isn't that largely the purpose of the church in the first place, to lead us to Zion?" Why, they wonder, do we seem to be heading at such a frantic pace in the opposite direction? Most of us believed if we would only "stay in the boat and hold on," and follow the directions of our leaders, those leaders would lead us to Zion. Russell Ballard said as much in the last session of conference. But Elder Ballard was teaching us falsehoods, among them that when the leaders of the Church speak, it is the same as if the Lord himself was speaking. Had we been paying attention to our scriptures all these years, we would have realized that Zion is not a church, and that "staying in the boat" and depending upon someone else to lead us back home to God sounds suspiciously similar to the scheme proposed by Lucifer in the pre-existence. But many active and faithful tithing paying members have concerns about what the church has been and is doing with their tithing. More importantly, many are wondering if the church’s expenditures are getting the world any closer to establishing Zion....Some wonder why the church is so focused on buildings, real estate development, farm ownership, and marketing when its true goal should be to build a Zion people? Are meetinghouses and Temples and TV ads truly that important in this effort? Could you imagine what could be done if the church used its tremendous tithing fund (instead of just the fast offering fund) to assist the poor in the church and around the world? What effect might this have in bringing souls unto Christ and to the establishment of Zion? On his blog, the bishop shows a photo of a video Billboard the Church is leasing in Times Square, which is costing the Church millions of dollars. The question that immediately comes to mind is "how many converts can we expect to get as a return on those millions?" I'll venture a guess: very few. But those who authorized that expenditure had to know that converting anyone to the gospel of Christ was not the reason our tithes are being spent in that particular venue. The reason for the expenditure is the same as any other such advertisement by any other major corporation: to enhance our image and increase our visibility. Just as with the Church's latest fiasco, the recent box office bomb Meet the Mormons, no one really cares about our image except us. Virtually no non-members were motivated to fork over money for tickets to see Meet the Mormons in theaters. The few who did show up, an estimated 64-75 thousand, already happened to be Mormons and had, oddly enough, already met scads of other Mormons before showing up to that movie. I don't know how things went where you live, but here in California attendance was sparse on opening weekend (when box office numbers are tallied by the trades); it did well the following Monday for family night, then immediately dropped like a stone. I was actually embarrassed to read that the Church held a "premiere" opening for the film, complete with press, a smattering of VIPs, and a collection of what passes these days for LDS celebrities. We are spending desperate amounts of money because we desperately want the world to understand we're just regular folk. That was the objective of the recent "I'm A Mormon" video campaign, which featured a disparate collection of Mormons who actually didn't seem to be anything like the rest of us, other than having in common membership in the same church. At least the people in that campaign were rather ordinary in their extra-ordinariness. The people in the movie Meet the Mormons were so not like any other Mormon I've ever met, it made me wonder what the filmmakers had in mind by profiling them. They were featured because they lived lives of singular accomplishment. So was it the purpose of that movie to show the rest of us how utterly mundane and uninspiring our lives were in comparison to theirs? As if I wasn't already depressed enough, Jeffrey Holland. Thanks for bringing the funk. One thing I thought was curious about Meet the Mormons was that it profiled a Mormon wife and mother who also happened to be a female kick boxer. Is this what the Prince of Peace would have us celebrate -a woman whose chosen vocation requires her to beat the living snot out of her non-member opponents? Besides, doesn't celebrating a woman who fights for sport contradict the counsel of one of our own late apostles? Well, James Faust has been dead seven years now, so we can ignore him, right? Aren't we constantly reminded that only the living oracles have any clue what they're talking about? So relax. It was living prophets and apostles who promoted this movie featuring a scrappy dame as somehow representing "the nobility of Mormon womanhood." James E. Faust can just talk to the hand. Anyway, I've got news for the marketing geniuses at Church headquarters: most people have already met a Mormon or two sometime in their lives. So why would they want to pay good money down at the Cineplex to see an infomercial about six unusually accomplished members of our faith? Most people already know we're "just like them" and they still don't like us. So why throw buckets more of the member's hard-earned tithing on a movie that doesn't even touch on what it is we Mormons believe in? Again the answer: To enhance our image and increase public visibility. We are busy marketing the Church as if it were a product, one we want people to have a positive impression of. Those in Church management throwing ideas at the wall aren't even thinking in terms of religious belief, but in hopes of developing the Church as a recognizable brand. That's why Church spending today is not controlled on a spiritual level, but by the corporate mindset. You believe Jesus Christ is still guiding this Church? Then why don't we rely on Him instead of enlisting outside firms and focus groups to help us plot our next strategy? There is more than a little truth to what blogger Will Carter observed: "The Church, whether by precept or example, actually steers people away from coming to Christ." What we ought to be doing is start behaving more like our namesake and learn to emulate Him. If our leaders would stop trying to think up more and more rules they want us to follow, and focus instead on the Golden Rule, we might begin to get some positive attention from the outside world that wouldn't have to be paid for with bribes. I was on the phone today with a friend who is a former bishop, just recently released. (You'd be surprised how many bishops -mostly former, but some currently serving- have contacted me to lament about what they see happening to the church they love.) My friend wanted to talk about the new banner ad the Church paid $400,000 to place at the top of the page when folks log in to YouTube. (That's just the cost of placing the ad; that number doesn't include production costs.) It's a nice, two and a half minute mini-movie that reminds us that Jesus is the gift of Christmas. There's certainly nothing wrong with it. I like it, and so did he. Very moving. But, the bishop asked, to what end did they spend that money? What was the motivation for spending the people's tithes on a film that doesn't really say anything new? Does the Church think the public is unaware of the true meaning of Christmas? What is unique about that message? 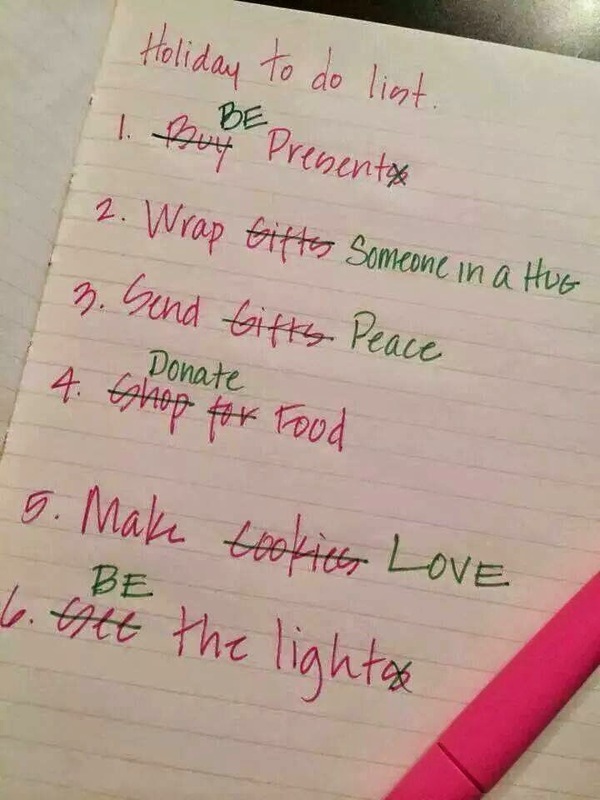 In other words, what purpose does it serve other than to remind people (as many others are already doing) that this is the season we celebrate the birth of Christ? Will it serve to convert anyone to Christ who isn't already converted? I don't think so. Will it serve to convert anyone to our church who isn't already converted? I highly doubt it. As I write this, so far the movie has received over two million hits, and I'm glad it has. I hope it gets millions more. So you may wonder why I and the bishop remain dubious. Why so cynical? Did we fail to see the message of this ad? We're not cynical, and we didn't fail to see the message. We just wonder what the leaders who green lit that $400,000 expenditure expected to accomplish with it, especially in light of what they could have done with that money that might have actually pleased Jesus by accomplishing His purposes. Did they hope to engender good feelings? Then mission accomplished! Did the ad engender good feelings toward Mormons? Perhaps, but not likely. At least, I don't think it will change anyone's mind about us one way or the other. There's nothing really unique about the message, after all. The view that Jesus is the gift, that His birth is the reason we celebrate Christmas, is a belief shared by all of Christendom. After the ad is over the viewer is asked to click a box if they'd like a visit from the missionaries. Aside from the fact that most people surfing YouTube can't wait to skip past any ads, the thing the bishop reminded me of was this: if the video is good enough, it will go viral on its own. After all, it already had hundreds of thousands of showings from missionaries and enthusiastic members without ever being on YouTube's front page. So what does it say when the church has to pay nearly half a million dollars to nudge it further in hopes it will gather more buzz? If you think my bishop friend and I are cynical, what do you think the reaction is among the public at large? As the bishop aptly summarized the problem, "the Church spends millions of dollars creating mediocre crap, then they spend millions more advertising the hell out of it." This incessant promoting of ourselves is not part of the mission of the church. As another Mormon blogger aptly put it, "public relations is not a priesthood responsibility." Yet here's the thing this bishop and I both agree on: under certain conditions, neither of us would have any problem with the Church shoveling millions of dollars of surplus funds on marketing and advertising, whether it's this Christmas tribute on YouTube, the "I'm a Mormon" campaign, or that infomercial disguised as a documentary recently released in theaters as if it were an actual feature film. No, what bothers us is that the Church hierarchy did not first earmark sufficient tithes toward the purposes God intended them for. Once the tithing is spent for God's purposes, we couldn't care less how much leftover funds they put toward marketing the institution itself. But here's the disparity: Tithes are estimated to bring in something in the neighborhood of 5-7 BILLION dollars a year, and the leaders spend almost none of that in the only way it counts: to alleviate the suffering of those who are truly hurting. Instead, they concentrate their efforts into marketing The Brand. • About 120,000 active LDS children suffer from chronic malnutrition. • This leads to a cycle, in which their own children will be malnourished as well. Those four and a half million members who faithfully pay their tithing? Most of them probably think their money is being used to at least help alleviate the suffering of their fellow Mormons around the world. But it isn't. Too much of it is spent on promoting the idea that Mormons are groovy. All 120,000 of those hungry Mormon kids could be helped for a year on only $6 million. Yet the LDS Church, that same corporate behemoth that sank THREE BILLION DOLLARS into a high-end shopping center in Salt Lake City, doesn't provide assistance that could nourish its own member children living in poverty. That responsibility instead has been assumed by a group of concerned latter-day Saints who have formed a charity called the Liahona Children's Foundation, and they go around begging the rest of us to please do something to assist our own. Maybe the Church(TM) can't alleviate world hunger, but is it too much to expect someone at Church headquarters to re-funnel some of those advertising dollars in the direction Jesus Christ would have them spent? For heaven's sake! These are Mormon kids going without, many of whose brains will be irreversibly stunted for life because of the effects of malnourishment on their bodies; children who happen to belong to a church that used to be known for taking care of its own. Maybe now you can see why literally thousands of faithful latter-day Saints are saying "enough!" to the corporate fraud and financial abuse, and are diverting their tithing funds where they feel the Lord wants them. Have you even heard of the Liahona Children's Foundation? Well, maybe that's because they don't have any money to waste on feel-good marketing campaigns trying to convince the world how unique they are (while at the same time of course being noticeably normal). The Liahona Children's Foundation instead depends upon the generosity of fellow Mormons like you and me, and they neither waste money promoting themselves, nor do they practice priestcraft like certain people I could name. 100% of the donations to Liahona go toward programs to feed and educate the children. All overhead costs are funded privately and managed with volunteer support. Maybe you'll consider pitching in. Because that's how tithing money should be spent. More and more good latter-day Saints are baffled when they learn how much tithing money is squandered on pet projects that promote admiration for Mormons as a people, instead of promoting the gospel of Christ. Some are looking at what's going on in Salt Lake City and asking "What in the world are they thinking?" "The LDS church is not the same today as it was 10, 20, 30 or 40 years ago. The Church makes decisions using models based on business and political theories. This is ill-fitted for a religious movement. The result is that changes are made hastily and without careful consideration given to doctrine or how abandoning doctrine affects members. "The LDS church sells the product "Mormonism" to a target market of the unconverted or non-members. Their present customer base (members) have been put through jarring changes...Despite these dramatic changes, the institution has largely managed to keep their loyal customer base. This gives the leadership confidence that the greatest part of their customer base is secure and will never leave. Therefore, their adaptation is tailored to their target market. This includes a demographic who are in large part...noticeably lacking in the ability to think critically. This is the future Mormon consumer or target audience. "To make this work, the church pares down its teachings, and reassures the loyal customer base that the radical changes are okay because the church cannot lead its customers into error or apostasy. There are two important tenets that have superseded all others: the church is led by a "prophet" and the leaders "cannot lead you astray." These MUST emerge as the primary themes. Any dedicated study of doctrine and history shows the church is riddled with contradictions, mistakes, missteps, changing and untrue claims regarding history and non-scriptural dogma. This is excused and rationalized by the propounding of the two mandatory teachings of a "prophet" who "cannot lead you astray." There is more to this analysis on Denver's post titled Patience and Faith. "My parents recently served a mission in a third-world country. I am sad to report that in trying to get people qualified to go to the temple, they regularly told people that it was more important to pay their tithing than to FEED THEIR CHILDREN. I wonder what these poor parents with starving children would say if they discovered that the sacred funds they donated to the church, in good faith, would be used to buy the front page of YouTube, or to buy a billboard in Times Square, or to make an extravagant movie — about Mormons?" "I can remember in leadership training – probably 40 years ago, maybe more – that helping those in need at that time was a primary obligation. We were told that, should fast offering funds run out, those in need had a claim on the tithing funds of the Church. While a financial clerk during that period, I recall writing a check for over $10,000 for an operation one of the ward members needed – one who had never come to a meeting while I lived in the area. More recently, one of my sons needed assistance with his family (lots of medical and financial challenges) and he related some of his humiliating experiences he had with that. My, how things have changed." "I think a corporation that encourages the poor to sacrifice food, heating and warm clothing to help it increase it’s billions of dollars of assets is despicable." "When the church spends 3 billion dollars to build a mall in the courtyard of the temple, I think it is pretty safe to say that any input Christ may have had was not taken into account...Maybe He is just letting the watchmen on the tower do as they please while the rest of us daub the wall with untempered mortar (Ezekiel 13). The solution that my wife and I have decided to take is to give our tithing directly to the Lord, and to bypass the middle church entirely. "Because of this decision, I no longer consider myself worthy to enter the temple...I still go to church because I believe in Christ, and because I love the members. But mostly because I love Christ. I am in President Eyring’s ward and have an interview with his son (the Bishop) this Sunday. I guess it will all come to a head then. I think it is unfortunate that I can no longer attend the temple. I was sealed in the temple to my wife, and our children and eternal relationship means everything to me, but if the gatekeepers deem me unworthy, I pray God will understand. All I know is that when I put my tithes into the Lord’s hands directly (and receive tithes from others – God bless their souls), it feels like Zion, and I love it." "I’ve been pondering and praying about these very issues for the last year. I have been a full-gross-tithe-payer for all of my more than forty years. I customarily send my tithing at the end of each year as a bank wire to church headquarters. However, this year, I’ve been deeply troubled as to how to act. Many months ago, when I read that verse from the JST Genesis that you quote, my eyes were opened, and I was deeply convinced that tithing is primarily about the poor. Only when the poor have been well-taken care of should we look to other priorities. "My question to the Lord was, how should I act on that knowledge? I am not in a position of authority or influence. And how can just one person make any difference? Then, one evening in September, as I was washing the dishes, my answer filled my mind and heart, and I knew just what to do. I waited several months to make certain that my answer was sure, for the sake of my wife and family, given the possible consequences. "Just two days ago, I signed up for tithing settlement. Next Sunday, I’ll hand over my check to the bishop. 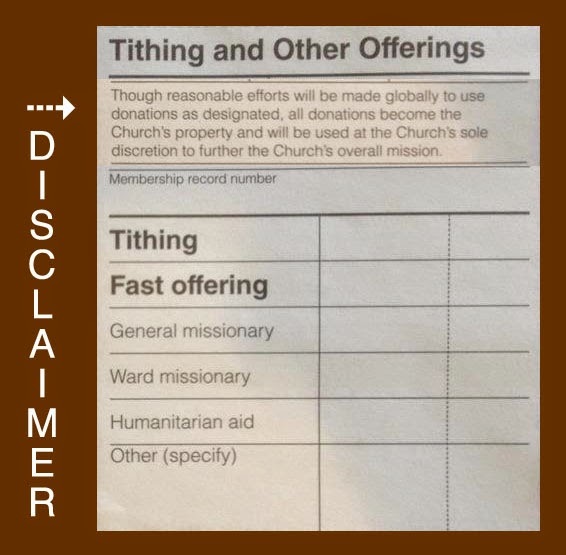 But instead of checking the “tithing” box on the donation slip, I’ll check “fast offering”. My entire tithing donation for this year will therefore go to the poor and needy. I will still formally declare myself as a full-tithe payer, as I truly believe I am and will still be before the Lord. "I will be completely open with the bishop about what I’m doing, and why. The bishop (and possibly stake president) will then need to decide whether to take away my temple recommend as a result. Will I be deemed unworthy to attend the temple if I prioritize assisting the poor and needy over building, maintaining, and proselyting? Can I continue to hold my calling which requires a current temple recommend? It will be an uncomfortable decision no matter which way it goes. Do you judge worthiness by the church handbook or by Matthew 25:40? "My sad observation: if I pay Zero dollars to the tithing fund, I’m not worthy to enter the temple. But if I pay Zero dollars to the fast offering fund, I’m good to go." A few years back, I was reading in the book of Mosiah, chapter 18 when I stopped for a moment on verse one where we are told "Alma repented of his sins and iniquities." Now, normally I would skate right over those words, not realizing we are being told something very specific here about Alma's past sins. But this time I was intrigued that Mosiah would specify sins AND iniquities. It goes without saying Alma had much to repent of. After all, he had been a high priest in the court of King Noah, as guilty as the others of lording it over the people of the church and living off their substance for his own comfort. I had never looked up the meaning of the word "iniquity" before. I saw it everywhere in the scriptures, but simply assumed it was a synonym for "wickedness." Chances are so did you. But notice how often we see the word used in conjunction with other sins, such as "sins and iniquity" or "iniquity and abominations." As it turns out, iniquity has a very specific meaning. It's a sin, alright, but iniquity is mainly the result of an especially egregious type of sin, a sin that can only be committed by those in high places. Iniquity is defined as "lacking equity" or "inequitable due to injustice." In a sense, it has to do with people being unequal. But don't misunderstand: this has nothing to do with not being equal in the way most of us are to some extent by nature. You may be my superior in abilities like sports, or learning, or even in earnings, and in that sense we are not equal. And everyone is fine with that. Everybody's different. Iniquity, on the other hand, results when one group benefits at the expense of others under their control. The relationship between them is unjust. It is not in balance. It is lacking in equity before God. And all as a result of the assumption that one party is just a little bit superior, a little bit more worthy, a little more entitled than the other. A curious earmark of iniquity, and one reason it is difficult even to recognize once it has been in place for a sufficient time, is that those who find themselves in the inferior position in the relationship often don't tend to question the arrangement. They just think of it as "the way things are." In a previous post, Lake Wobegon Mormons, I pointed to the example of the class distinctions in the British Isles, which had been in place for centuries, and how the people of the lower classes unquestioningly accepted the right of the privileged class to rule over them. Class distinctions required members of the working class to be ever obsequious to those who ranked above them. An English footman or scullery maid might find themselves bowing and scraping to a member of the superior class on the street, even when not in that person's employ. God made some men superior to others -that was just the way things were. It was the lower classes in England who were converted to the LDS Church by apostles Brigham Young, Heber Kimball, and others, and who made up the bulk of the saints who followed those apostles to the Rocky Mountains. They were accustomed to being deferential to authority, as are their descendants to this day. An extreme example of iniquity could be found in antebellum America, where most slaves, born into that life, never even thought to question the propriety of the practice. To both master and servant, it was the unquestioned natural order; one ordained by God. Even generations after slavery was abolished in America, iniquity remained, as black parents taught their children the importance of "knowing your place." Alma and his cohorts in the court of King Noah were living pretty high on the hog at the expense of the humble people they ruled over, and the people seemed to accept it, however begrudgingly. It took a certain old man with an amazing amount of chutzpah to even challenge this natural order, and when he did, the entire court turned on him for his appalling lack of deference. The priest class had been taking the substance of the people for themselves for a very long time. They justified it because, in their minds, they were using the substance for the benefit of the Church. It was not difficult for them to justify their entitlement to a portion of the tithes for themselves, even an unusually large portion, because of the selfless service they believed they were performing on behalf of the people. Those leaders managed to live in relative comfort, even if some of the people supporting them had to struggle to pay their tithes. The Book of Mormon warns us repeatedly to be on the lookout for the sin of iniquity in our own day. Crack open your concordance and you'll find 216 separate instances in the Book of Mormon where that warning is given, and dozens more in the Doctrine & Covenants. The leaders of my Church today are exempt from paying tithes. Yes, that's right. As often as they harangue the rest of us to get our tithing money in on time, they don't have to pay any themselves. And that isn't because the Lord issued a revelation declaring the priest class exempt from the law. What happened was that a mere seven months after our founding prophet's body was in the grave, the twelve apostles took a vote among themselves and decided they were too important to have to pay in like everybody else. Every now and then I'll read about someone who has left the church who says, "the best part of quitting the church is I just voted myself a ten percent raise!" The Quorum of the Twelve voted themselves that same raise, and they didn't even have to quit. They enjoy all these perks of office and more because they have literally robbed the poor to obtain them. You think I'm exaggerating? There was a time when it was understood in this church that widows, the disabled, and the destitute were exempt from tithing. That was frequently taught from the pulpit by apostles such as Orson Pratt and James Talmage. Not any longer, as evidenced by this April 2005 conference talk titled "Tithing-A Commandment Even For The Destitute." You may be interested to know that the general authority who gave this talk made his personal fortune founding the Franklin-Covey Leadership Seminars, and likely hasn't a clue what it means to be truly destitute. He also does not provide within that talk any doctrinal statement from the Lord to support his thesis. “If paying tithing means that you can’t pay for water or electricity, pay tithing. If paying tithing means that you can’t pay your rent, pay tithing. Even if paying tithing means that you don’t have enough money to feed your family, pay tithing." “If paying tithing means that you can’t pay for water or electricity, pay tithing, for your tithes help to ensure that the water and electricity in the homes of the general authorities continues to flow unabated. If paying tithing means that you can’t pay your rent, pay tithing, for your tithes are required to pay the costs of the exceptionally nice homes the general authorities have been given to live in, as well as for their vacation homes in Utah's resort areas. Even if paying tithing means that you don’t have enough money to feed your family, pay tithing, because your tithing ensures that the general authorities and their children will never have to worry about where their next meal is coming from." Our beloved general authorities also enjoy perks of office that border on the silly. While you and I are expected to walk from our cars to the temple, the elite of the Church get the privilege of being transported underground from the Church office building to the temple on electric vehicles through a short tunnel that leads to an entrance in the basement of the temple. Now, it may seem petty for me to bring this up, until you recall that there are people in this church who don't have the use of their legs at all, and who earn very little money; yet those valiant members struggle to pay tithing so the privileged class can use those tithes to hire drivers and have little electric carts shuttle them fifty yards to the temple. At least apostle Tom Perry has refused to take advantage of this privilege, if only for the sake of his pride. "I'm a former Marine," he told a friend of mine, "That'll be the day when I have to ride a golf cart to the temple." Well, let's not quibble here. Let's just accept that these men are too important to make it to the temple under their own power. 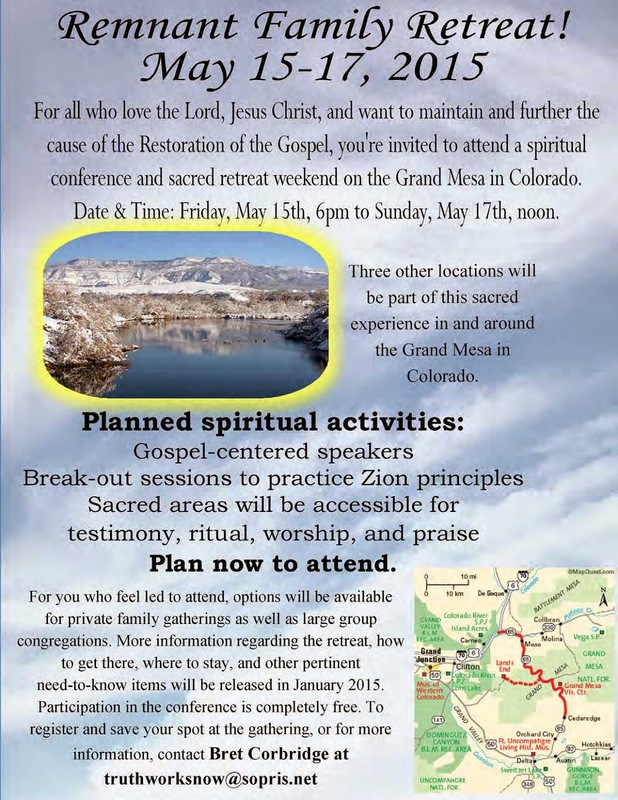 A handful of fellow bloggers and I have been in talks about holding a family reunion of sorts to be held in Colorado in May for those kindred spirits who have resolved to start putting Christ and His gospel first in our lives. Already over 200 people have confirmed plans to meet with us there, and if you share any of the sentiments presented on this blog, I would hope you might wish to come too. Sadly, already there are some wild rumors and assumptions about what we hope to accomplish, which I suppose is to be expected. So to answer the main question, what we hope to accomplish is simply this: We'd like to get together with other devout latter-day Saints and meet one another and make friends. The event will be very loosely structured, and no, it is not an attempt to "start a new church" or found some kind of commune or establish Zion then and there. There will be no leaders at this event. I'm not even sure you could even call this thing an "event." If you were to get together for potluck dinner with a group of friends, you wouldn't expect any one person to emerge as the "leader" at the table, would you? You would simply enjoy one another's company unhindered by any preconceived expectations. Since Adrian created this FAQ, we have heard from a nice young couple who are working on organizing and supervising activities for younger children, and perhaps even something geared toward teens. Children will be shown how to fish and make pottery while the adults are otherwise occupied, so I'm excited at how this thing is coming together. As I said, although the dates are set, more details will be provided in January. Meanwhile, for additional information and updates, keep checking here, here, here, and here. A Note About Commenting: I again remind those who wish to comment that posting only as "Anonymous" is no longer permitted. You do not have to use your real name, but if you insist on choosing "Anonymous" from the drop-down menu, you must invent a username and place that either at the top or bottom of your comment so that readers can tell you apart from the many others who for some reason keep choosing to post under the anonymous option. If you have a Google registration, use that one, otherwise it's best if you check the box that says "Name/URL", place your preferred username in in the "name" box, and ignore the box that asks for a URL. That way you can still remain anonymous if you so wish, but then other readers have a handle to address you with when responding. Comments missing any kind of identifying moniker are at risk of being deleted. I'm very strict about this because too many people posting as "anonymous" has resulted in chaos in the past.